Joe derisively snorted at the pay stub in his hand. Crumpling it into a ball, he wound up like a baseball pitcher and fast-balled the wad of paper across the room. It bounced unsatisfying off the wall and onto the floor, coming to a rest near his feet. "Guess I'm not cut out for the big leagues," he muttered to himself. Flopping down on the couch, he snatched the remote and jabbed it towards the high-def TV, hoping to take his mind off it all. With his head in one hand he began to channel surf with the other, staring blankly at the flickering screen. The cell phone on the coffee table suddenly buzzed while playing "In the Mood" by Glenn Miller. Joe jerked out of his trance, leaning over to catch the spinning device. "Hi Dad," he dejectedly said, "what's up?" "You interested in watching the NCAA tournament at Mac's? They've got great specials during the games," his dad asked. "I can't afford it, Pops. All of my money goes to taxes," Joe answered. As outrageous laughter burst forth from the other end of the phone, Joe pulled it away from his ear and scowled at it. Snapping it back, he said annoyingly "Dad, this is serious. I'm getting taxed to death!" His dad laughed so hard that he went into a coughing fit. After hacking and spitting, he finally calmed down telling Joe "you have no idea what you are talking about." His brow furrowed in confusion, Joe's mood changed from anger to curiosity. "What do you mean?" he asked. "Son, the income tax you are paying now is much lower than what we paid when I was in my prime," he replied. "Back in my day, over 50% of my income was taxed. 50%! And I didn't have it as bad as those who earned more - some of them were taxed at over 80%," he calmly informed Joe. "Not at all. The taxes from World War II were sky high. And the government didn't drop those rates until nearly twenty years later," he recalled. Joe put his finger to his chin in thought. Maybe I don't have it so bad. Standing up, he said "Dad, let's go watch the game - my treat." The above short story only illustrates a lower-middle income tax family. If you were really wealthy back in the 40s and 50s, a great deal of your income was taken by the government. Even if you were quite poor, your tax rates were still above today's rates, so it affected everyone to varying degrees. The above graph is called a 'box and whisker' chart. The lower line represents the bottom 25%, the lower half of the red bar the next 25% up, the top half of the red bar the next 25% and the top line is the top 25% of all the marginal tax rate brackets. 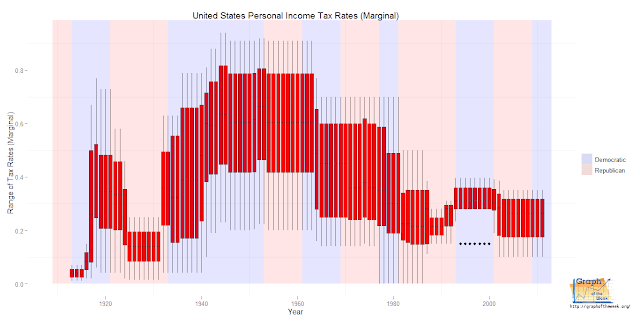 Although the prior statement seems like a mouthful, you can generally see how the tax rate has fluctuated wildly over time. The single person tax tables were used to generate the above chart. When plotting other charts such as married (filing separately or jointly), they all looked nearly identical to the one above. For the political inclined, the graph is also colored to show the party of the president in power at the time. Read into that what you will! Wars are hideously expensive, not to mention horrifying (see last week's graph "U.S. Soldiers Died from What?"). In the above graph, tax rates skyrocketed during both world wars, gradually coming down later (much later in the case of WWII). The poorest 25% in this country have had their tax rates vary by about 20%. The wealthiest 25% have had their tax rates vary by nearly 90% which has sparked considerable debate. Today's tax rates are relatively low. If you didn't have a chart to look at, point #5 would seem unbelievable. With so much economic turmoil affecting American life, it probably seems that tax rates feel high. However, this is clearly not the case. As a side note, a period of low taxation preceded both the Great Depression as well as our current recession. More research will be required to help explain that phenomena. Many people will no doubt be taken aback when looking at historical tax rates. It wasn't all that long ago when the entire populace was taxed at extremely high rates over a span of twenty years. If you have felt like Joe recently, perhaps this will bring some peace of mind. Although the size of government has grown and certain liberties are being assailed, our tax rates are still comparatively low. You might be wondering how the government can be so large with low tax rates? Only personal income tax was examined here - there are many other sources of revenue for the government. Additionally, the population is larger which means a larger tax base which means more absolute dollars available as well. Further, the federal deficit is enormous, meaning that the U.S. has borrowed a lot of money to keep its programs functioning. In short, economics is a complex subject due in part to the fact that it is based on human behavior, therefore the best anyone can do is make educated guesses regarding its performance. It's easy to feel like a victim when it comes to taxation, especially since it comes in so many forms. However, residents are enjoying very low personal income tax rates when compared to historical numbers. Whether or not income should be taxed at all is another issue which will not be discussed here. As we dig deeper into this sensitive issue, there will be future charts on taxes featured here on 'Graph of the Week', so stay tuned. Until then, enjoy taking home more of your pay than your parents did. 1) What are the other sources of governmental revenue? 2) Will tax rates ever stabilize for more than a few years? 3) Tax rates shot up after the Great Depression - will they go up in response to our recession? Labels: historic tax rates, income tax, income tax brackets, Money, Politics, R, taxes, U.S.
Patrick, the graph could mislead one to think that all is fair in the income hierarchy. Well, according to the NYT article, "Share of the Nation's Income Earned by the Top 1 Percent /graphs, published w/graphs on Oct. 25, 2011, a different picture emerges-sources cited: Thomas Piketty & Emanuel Saez; Urban Institute, Brookings Institution. "Top Earners Doubled Share of Nation's Income Study Finds," by Robert Pear who cites the Congressional Budget Office on their Tuesday new report. As to your Questions #2 & 3 re: taxation: My reponse: No. Because The cost of bailouts, and ongoing corporate subsidies, tax loop holes,tax shelters, tax write offs,etc. are ongoing into the future; also benefitting are the private defense constactors and allied mercenary armies. It's the taxpayers w/lesser incomes who pay the bill by diverting taxes away from the public welfare. I'm not sure how the graph is misleading - it shows the entire tax bracket range for all income levels since 1911. To tell the story of who are the richest and how few those individuals might be is another story altogether. Income and income taxes are a sensitive subject which is why I'll be doing more graphs on this issue. Also, corporate tax is another story as well - one that might prove the most interesting! I am a student looking to create a similar graph. I am looking at the data and wondering if you could provide the code of how you organized it all before creating this graph? This was a straight-up read of the downloaded csv file (unlike many other data sets which require a lot of work to get them into a useable form).